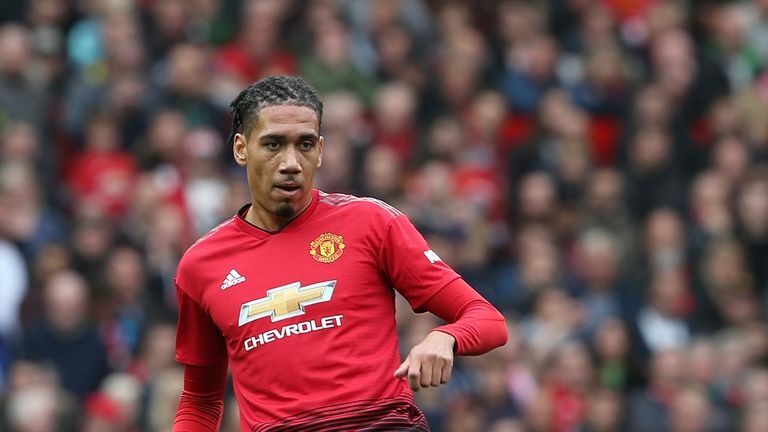 Manchester United defender Chris Smalling says his strength and power have increased following his switch to a vegan diet. The 29-year-old has stopped eating meat, fish, eggs and dairy products and insists he's been reaping the benefits. "We did a test of our hamstrings and I've increased by 35 per cent from the last test. On the [exercise] bike, my power output has gone up," he told Sky Sports News. "I'm constantly getting stronger and getting better results." Smalling returned to the starting line-up for United's win at Fulham on Saturday after a lay-off with a foot injury. He insists his body recovers much quicker since cutting out animal products from his diet. "Even before I went vegan, in terms of cutting out red meat, my tendinitis and recovery after games was vastly improved. "I had quite a few symptoms, but since I went fully vegan I don't feel it at all anymore. "The second day after a game is often when I feel most fatigued, but my fatigue levels have gone down and, on the second day, I've felt a lot more recovered than previously. "Even my skin, I had a lot more break outs before than I do now. I'm feeling a lot of physical benefits from it." Smalling is not the only sportsperson who has switched to a plant-based diet. Chelsea Women's Karen Carney, tennis star Venus Williams, five-time F1 world champion Lewis Hamilton and WBA Continental Cruiserweight Champion Lawrence Okolie have all made the change. There is even an all-vegan football club - Forest Green Rovers of Sky Bet League Two are the world's first. It is not just sportspeople ditching animal products, the concept is gaining popularity with the general public too. The UK plant-based market was valued at £443m in 2018, according to market research company Nielsen. In 2017, takeaway delivery service Just Eat found that demand for meat-free food was up 987%. The traditional stigma associated with veganism appears to be changing. "In terms of other sportspeople, you can see them thriving and talking positively about it," Smalling said. "I spoke to the nutritionist and head chef [at the club] about different options, a lot was influenced by [my wife] Sam and what we have at home. "The chef makes me a vegan section and often quite a lot of the other players are looking at it thinking: that looks good. And then by the end of the dinner, a lot of it's gone. A lot of them are trying it. "At home, we try to plan what we cook in the week. When we go to the supermarket I'm often the one pushing the trolley and Sam's chucking stuff in. I like Thai food, Jamaican stews with yam, pumpkin and sweet potato." While the majority of people have supported Smalling's lifestyle change, others haven't been quite so understanding. "Just a silly question! It made me laugh at the time."